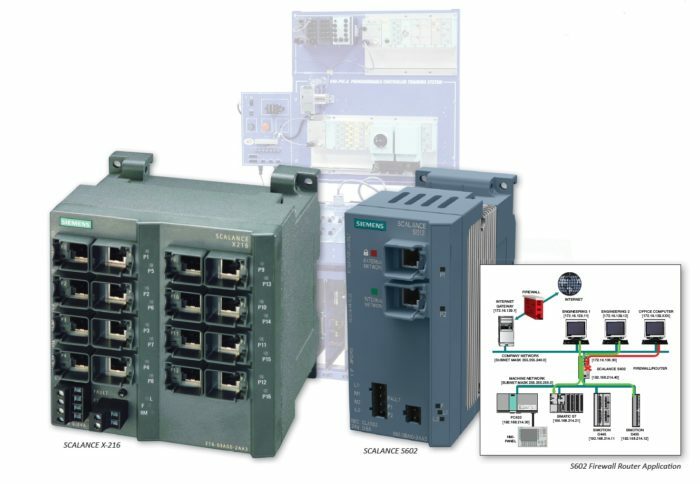 Amatrol’s PLC PROFINET Learning System – Siemens ET200 (89-PNET200) teaches PROFINET communications in Safety PLC applications. Specifically, this learning system focusses on the Scalance S602 Firewall, an industrial IP hardware firewall and router that enables protected networks to take advantage of network connections and resources while preventing them from unauthorized use and access. PROFINET is an invaluable application used in many industries. Major topic areas within the 89-PNET200 curriculum are Scalance S602 firewall/router, Scalance switches, and PROFINET configuration and diagnostics. The 89-PNET200 includes a PROFINET assembly with network protection module and Siemens managed EtherNet switch, a PROFINET connector, PROFINET cable set, student curriculum, instructor’s guide, and an installation guide. This learning system adds to the Programmable Controller Troubleshooting Learning System (890-PECB) and the Siemens ET200PRO-Safety PLC Troubleshooting Learning System (890-ET200SF) to expand Amatrol’s offering of Safety PLC curriculum. The 89-PNET’s curriculum covers the function, operation, and configuration of the two included, real-world industrial components – a Scalance S602 network security module and a Scalanace X208PRO network switch. This will give learners a general understanding of networks and how to find information in a PROFINET system. As an example, learners will study the Scalance S602 network security module and learn how to configure the S602’s external network port IP address and subnet mask, configure and test the Scalance S602 as a firewall, and describe the diagnostic functions of a Scalance S602 firewall. For the Scalance X208PRO network switch, learners will describe two methods of configuring a Scalance X200 switch, configure an X200 switch using web-based management and diagnostics (WBM), and add a Scalance X200 switch to a STEP 7 project. In addition to the HMI learning system, the 890-ET200SF features an array of safety PLC learning options. Additional learning systems include: ET200S Stack Light Learning System (89-SLET200), ET200PRO PROFINET Pneumatic Learning System (89-EPN1), ET200 RFID Learning System (89-RFET200), and ET200PRO PROFINET HMI Learning System (89-HMIET200).